Former Claret Jay Rodriguez had a day to remember on Sunday as he scored two goals in a Premier League game for the first time in almost three years, as Southampton beat local rivals Bournemouth 3-1. The Burnley-born forward turned in the ball from close range following a lovely chip from Stephen Davis, before lashing home a 20-yard stunner against his old boss at Turf Moor, Eddie Howe. His last league goal came in August, with his last brace in March 2014 against Newcastle, shortly before a knee injury saw him sidelined for 16 months, before missing much of last season after ankle surgery. And he said: “The second goal I enjoyed, but any goal scored means a lot. “Just playing is the best feeling. “You want to be out there winning with your team. “I want more of it, and try to keep scoring and keep playing. The goals could hardly have been more different, but he smiled: “I don’t mind how they go in, as long as they go in for the team. “The first one was great for me - it’s an amazing feeling putting the ball in the back of the net. “For the second, I just turned and hit it and then just saw it go in. “If I feel it is right then I just hit it – that’s just a natural reaction. 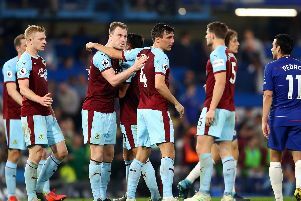 Rodriguez, in the side in the absence of another former Claret in Charlie Austin, out with a dislocated shoulder, added: “It’s massive for me and for my family. “They’ve been through it with me as well and to be part of the team today and grind out a win is a great feeling.